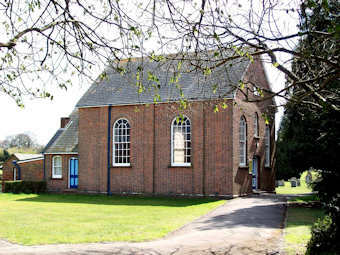 The Zion Baptist Chapel at Bounds Cross lies alongside the main A264 road, half way between Biddenden and Headcorn and close to a busy cross roads. Opened in 1880, the chapel sits in spacious grounds with it's graveyard alongside. The cemetery is difficult to visit outside of church service times as the car park is protected by a locked gate and the well used main road alongside offers no alternative parking places within easy walking distance. The GPR holds 120 grave and 237 person records for the burial ground.